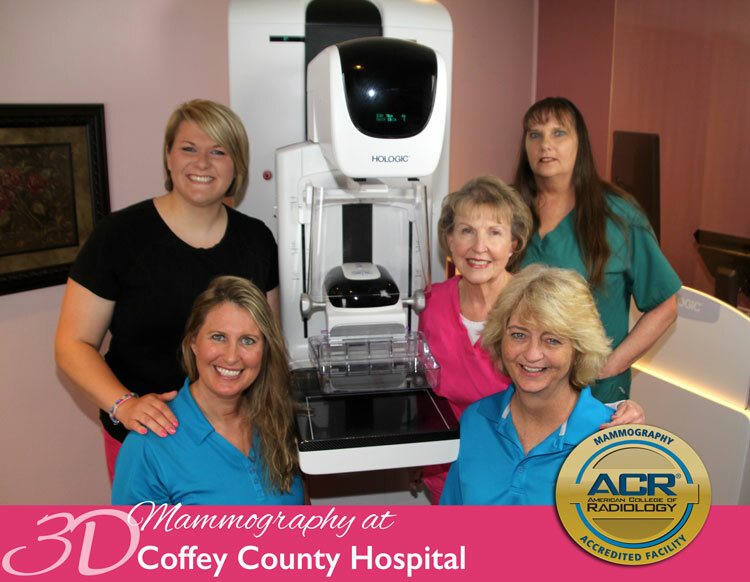 Coffey County Hospital’s mammography department is fully accreditation by the American College of Radiology. Accreditation assures that staff, equipment, processes, and image quality at Coffey County Hospital meet the ACR’s stringent requirements for patient care. Coffey County Hospital has four certified mammography technologists: Lynn Bolen, Melinda Chiroy, Jeanne Gerrelts, and Mary Ann Magnuson. Statistics show that one in eight women will be diagnosed with breast cancer. This statistic drives our mammography team to maintain a high degree of excellence, with the ultimate goal being early detection for our patients. Coffey Health System encourages annual mammograms beginning at age 40. Women with a family history of breast cancer should visit with their physician about earlier mammograms. To schedule a mammogram, call (620) 364-2121. If you are unable to obtain breast or cervical cancer screenings due to financial concerns, we encourage you to contact Early Detection Works. Click here to learn more.